Lately, there has been a lot of focus on business architecture within the EA community. We would like to expand the thinking of business architecture to include the element of information. Traditionally the focus of many IT shops has been in the delivery and enhancement of information systems that automated manual business processes. However, over time, the need has shifted more to the management of data assets than the automation of manual operations. But the focus of effort remains primarily on application delivery and integration, without the strength of a unified data management effort. This has lead to the equivalence of spaghetti code within the data domain – a myriad of redundant, untimely, out-of-sync, misdefined, inaccurate and incorrect data assets. 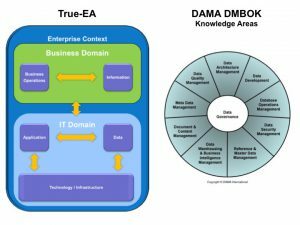 As I have written previously, DAMA (Data Management Association) provides a good body of knowledge (DMBOK) for data management. Without getting too hung up on the definitions for now, let me posit that data and information are two separate but related constructs, and that if one is going to be successful with managing the data assets of an enterprise, one must also develop complementary information management competencies as well. Within the DAMA DMBOK, one of the knowledge areas (which are set to be updated in DMBOK 2.0 in Q2 2017) is data architecture. However, as those of you who follow us know, True-EA considers information and data architecture as separate disciplines. Hence, while DAMA aligns with a data architecture competency, and there is also some alignment between technology components of the data management environment (i.e. DBMS, ETLT, middleware and other data integration components) and the infrastructure architecture; we suggest that you will have to supplement these aligned relationships with competencies in not only the other knowledge areas of the DMBOK, but also the other architecture domains of True-EA – business, information, application and infrastructure. A True-EA approach involves a couple of key factors that provide a more holistic and business driven architecture view for information and data management. The first is the separation of information (a business domain) and data (an IT domain) architecture responsibilities. The second is that the business domains (business operations and information) are owned and led by business professionals without a focus on the solutions. A true business ownership of information and data is a key tenet of success in the DMBOK. A tenet that many companies struggle with attaining due to the lack of separation of data and information domains, leading to the presumption by many business professionals that the IT group will handle everything. With True-EA, the involvement of business professionals goes beyond offering input. Information assets and usages are defined by and owned by appropriate business resources, leaving the role of data stewards to be filled by both business and IT professionals. This attribution of responsibilities to business owners and data stewards is key to almost every knowledge area of the DMBOK, most notably Reference and Master Data Management, Meta Data Management, Data Security Management, Data Quality Management, Document and Content Management, and Data Warehouse and Business Intelligence Management. Also, by mapping the business capabilities with the information models, you provide guidance on which business capabilities leverage which business information assets. With business capabilities also tied to application solutions and information assets tied to databases, this logical to physical relationship becomes a key to eliminating both redundant solutions and data stores. Within the context of business strategy and future state direction, the effort to prioritize those eliminations and/or replacements is simplified. One of the other challenges that folks run into with the establishment of a data management program is finding the right projects to implement the strategies, plans, and standards established by the DM group. In addition to the business context described above, the holistic nature of the True-EA approach results in a comprehensive set of roadmaps for all domains. These roadmaps should be vetted with the DM Group to identify the opportunities for implementing DM constructs within the projects and investments of the IT portfolio, enhancing Data Governance success. This includes insight into and leverage points between the infrastructure architecture and DM knowledge area Database Operations Management, as well as the technology and integration components of the other knowledge areas. Within the umbrella of a larger True-EA approach, it is possible to identify the relationships between the information model and the business operating model, it’s core capabilities, and strategic initiatives including, but not limited to, things like improving customer strategies, digital innovation, and other strategies where the enhanced enterprise-wide analysis would provide insight and guidance. All of these attributes improve the ability of the DM group to be more successful than they would otherwise.